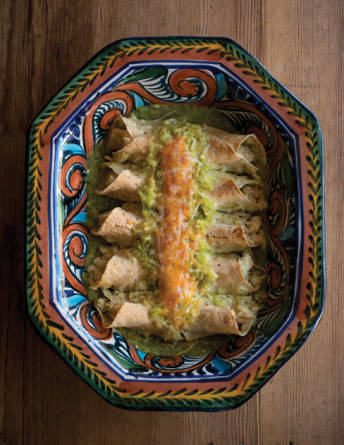 A recipe— a single recipe—enticed me to New Mexico. As I recall, it was 1969 and I was finishing up my high-school homework at the kitchen table of our family home, in Galesburg, Illinois. My dad sat down across from me with the day’s mail, which included an oversized envelope from our Congressman. Enclosed was a copy of The Republican Congressional Cook Book, imprinted “With the Best Wishes from Your Congressman, Bob Michel, 18th District of Illinois” on the front, and a picture of the legislator filling the entire back cover. Apparently, constituents in 49 other states and numerous other Congressional districts also received a book, courtesy their own Representatives. Food and cooking already fascinated me, but books on the subject weren’t yet being published in quantities sufficient to bury both the states of Illinois and New Mexico. My family, like most in that era, had a single “real” cookbook, attributed to the impeccably coiffed Betty Crocker. Near it, we had a small recipe box stuffed with index cards from grandmas and friends, along with a few short, mimeographed collections of recipes from the PTA and church groups, but no other cook books. So it was with some enthusiasm that I asked what was in this surprise package. I flipped past the moose Swiss steak from Alaska, considered the Chinese peas with soy sauce from Hawaii, and zeroed in on Green Enchilada Cassarole [sic]. The yummy-sounding recipe was supplied by then-Congressman Manuel Lujan Jr., from the faraway state of New Mexico. My family had trundled across the Land of Enchantment in our station wagon on the way to the Grand Canyon some years earlier, wending our way along Route 66. What I remembered most about New Mexico from that trip was the astonishing blue sky. Now I was face to face with a luscioussounding local dish of green chile, tortillas, chicken, and cheese. I knew a bit more about chile and tortillas than the average Midwestern teenager, because back when Wonder Bread ruled most of the fruited plain, Galesburg actually had several cafés run by Mexican-American families. Congressman (and, later, Cabinet Secretary) Lujan’s recipe looked very different, though, from what I knew generically as “Mexican food,” and it sounded quite fabulous. Reading about the dish made me sure I wanted to return to New Mexico and eat some of this exotic food. I visited once in my early 20s, and distinctly remember ordering a plate of green-chile chicken enchiladas in a Santa Fe restaurant. They were wildly better than the version I’d been able to cobble together using the Lujan recipe, since I had to rely on my Illinois supermarket’s canned green chiles, and even canned corn tortillas! I was hooked. In late summer 1980, I managed to wangle a job offer in Santa Fe and made my move. Over Labor Day weekend I visited Jackalope, a prime home-and-garden emporium, where I first saw green-chile pods being roasted and smelled that powerful smoky aroma, the one that says “home” to me today. I asked the man to roast me a sack of chile—40 pounds’ worth. I considered it my first step toward citizenship in the Great State of New Mexico. In the mid-1980s, I married Bill Jamison. Like me, he had a background in arts management, he was equally passionate about New Mexico and its food, and was already writing about the state and its heritage. I eagerly joined him in his research, and within a few years we got a dream assignment: writing a cookbook for the legendary Rancho de Chimayó restaurant in partnership with the founding Jaramillo family. We thought at the beginning that it would be our first and last cookbook, but we loved everything about the project, from working with the local cooks in the restaurant’s kitchen to the testing and eating of the recipes— including, of course, their enchiladas. We were hooked for life, both on the glories of New Mexican food and on writing cookbooks for a living. Now we’re at 16 books and counting, including two others that focus on New Mexican food: The Border Cookbook: Authentic Home Cooking of the American Southwest and Northern Mexico; and Tasting New Mexico: Recipes Celebrating One Hundred Years of Distinctive Home Cooking. It totally amazes me today to realize how greatly my life destiny was shaped by my high-school discovery of Congressman Lujan’s recipe. Maybe I would have made it to New Mexico without his enchilada casserole, and maybe I would have ended up writing about food anyway, but I sure wouldn’t have taken the chance of starting over without that early omen. I still have my father’s copy of The Republican Congressional Cook Book, and just a few years ago, I amused the Honorable Mr. Lujan with my story. Over the years, my enchilada recipe has evolved to this one. Freshly poached chicken makes an especially appealing filling, but you can also use about 3 cups of shredded roast chicken or other cooked chicken. The filling mixture can be prepared a day ahead of when you plan to assemble the enchiladas. Preheat oven to 350° F. Grease a large baking dish. Spread about ¼ cup of chile sauce thinly in baking dish. In small skillet, heat ½ to 1 inch of oil until oil ripples. With tongs, dunk each tortilla in oil long enough for it to go limp (a matter of seconds). Blot with paper towels if you wish. Dip tortilla in chile sauce. Top with about ¼ cup of chicken, a couple teaspoons of onion, two cubes cream cheese, and about a tablespoon of shredded cheese. Roll up tortilla snugly but not tightly. Transfer enchilada to baking dish. Repeat with rest of tortillas and filling. Top enchiladas with any remaining onion and pour remaining sauce evenly over them. Scatter rest of cheese over the top. Bake about 20 minutes, until enchiladas are heated through and sauce and cheese are bubbly. Serve right away. Thank goodness, I no longer have to settle for leathery corn tortillas from a can. Sure, we can all find freshly made corn tortillas these days, but for a special occasion, it’s nice to be able to say, “I made them myself.” Look for tortilla-grind masa harina, or the finest grind that a market sells. Most cooks use an inexpensive tortilla press for flattening the dough. If you’re going to the modest trouble of making the tortillas yourself, be sure to eat them soon after, or incorporate them into a dish that same day. Heat dry griddle or heavy skillet over medium-high heat. Mix ingredients with hands until dough is smooth—it should be quite moist but hold its shape. Add a little more water or masa harina if needed to achieve proper consistency. Form dough into 12 balls about 1½ inches in diameter. If not making tortillas immediately, cover balls with plastic wrap. Place ball of dough in tortilla press between 2 sheets of plastic (sometimes sold with the press), or use a pair of pint or quart plastic sandwich bags. Press ball until flattened to desired thickness, generally about 1/8 inch. Carefully pull plastic from round of dough and lay dough on hot griddle or skillet. Cook tortilla 30 seconds, flip and cook it 1 minute on other side, then flip it again to cook first side another 30 seconds. Tortilla will be speckled with brown flecks. Cover cooked tortillas to keep them warm while remaining balls of dough are shaped and cooked. Serve warm in basket with butter or salsa, or reserve for enchiladas or other dish. Here’s the sauce for the enchiladas—what New Mexicans usually call just “green.” The sauce keeps at least several days and freezes well. Four-time James Beard Foundation Award–winning writer Cheryl Alters Jamison has been further honored with recent awards: from the International Regional Magazine Association, for her New Mexico Magazine feature “Amazing Grazing” (September 2012); and, in August, from Edible Santa Fe, as a Local Hero: Best Food Writer. She is also the recipient of a NM-AZ Book Award, an International Association of Culinary Professionals (IACP) Award, and the Distinguished Alumni Award from the University of Illinois. See more of Douglas Merriam’s work at douglasmerriam.com.